Earlier this year I wrote a post about Internal Conflict based on a character’s flaws, fears and morality. Like External Conflict, Internal Conflict can be numerous and varied. The only rule is it all must get in the way of the hero achieving his/her goal. If it doesn’t, you don’t have conflict, just baggage. And then there is what I call the Prime Inner Conflict. This is a want or desire that doesn’t just conflict with the protagonist’s goal, it competes with it. The protagonist can have one or the other, but not both. Put simply, if the hero achieves his goal, he won’t get his inner desire; and if the hero gets his inner desire, he won’t achieve his goal. For example, in THE HUNGER GAMES, Katniss’s main goal is to win The Games so that she survives and can continue looking after her family. However, she also wants Peeta to survive. This is a huge Inner Conflict because only one tribute will be alive at the end. Katniss wants it to be her, but also wants it to be Peeta. It cannot be both of them. These two conflicting wants torment her the entire book. And readers can’t put the novel down because they have to find out how Katniss will choose between her life and Peeta’s! Such a compelling conundrum! So armed with that knowledge, I started developing the heroine for my latest WIP… but I struggled to create her Prime Inner Conflict. I laboured over it so much that I began to question whether it was really necessary. If it was so hard, maybe my story didn’t need it! 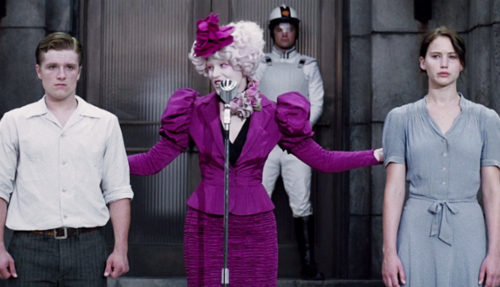 After all, everyone kept telling me that I didn’t need to write the next Hunger Games. Plus, my protagonist really, really, really wanted to achieve her goal! I couldn’t imagine there was anything else she’d want that much, let alone something that would make her consider giving up her goal. My character is very determined and principled – admirable qualities. Did she really need an inner conflict that would make her all self-doubty? Besides, there are lots of stories where the hero has an external goal and wants that external goal above all else. Right? Then, serendipitously, I read a book where the heroine had no Prime Inner Conflict. She had Internal Conflict (Should she trust that boy? Should she help that girl? ), but nothing ever dissuaded her from pursuing her main goal. For the first 50 pages this was fine, the story was exciting, the stakes were super high, and I was engaged in the heroine’s plight, and then… I got bored. Why? What had changed? Nothing, and that was the problem. The character’s goal was so one-note that I became frustrated with her. Didn’t she care about anything else? Why couldn’t she see that the world wasn’t black and white? And that’s when it hit me, why Prime Inner Conflict is so important – it’s real. Life isn’t simple, it’s not cut and dry, it’s messy and complicated. Characters who don’t wrestle with life’s inner conflicts (as we all do) feel fake and are harder to connect to and root for. Clearly, I needed to discover my heroine’s Prime Inner Conflict, stat! And I did. It was hard. It took a lot of soul searching. But I finally came up with something that felt real. And my story will be much better for it. How do you develop your characters? Do you struggle with their Inner Conflict? This is awesome. And totally spot-on. Isn’t it funny how a great book can turn “eh” if the proper ingredients aren’t there? And I love your honesty–that maybe your character didn’t need IC because it was too hard to write for her. ;oD Totally how I think, too. -S.
So true! And the more I learn about writing craft, the more I’m able to figure out why a story is meh. Thanks for the comment, Sydney! Thanks, Natacha! And your story sounds fascinating! We are so much alike in that we both write posts about what we’re writing about or struggling with. And this post, is serendipity at its finest. Because yesterday I was wondering whether or not to continue my character’s main inner conflict through to the end, even after the midpoint changes everything. I had just decided it was best and then I read your post. Love when that happens! Thanks for the comment, Sue, and glad that this post came along at just the right moment!